I thought I’d do a quick update on rhinos here on Zygoma, since the theft of their horns from museum collections is something that I’ve been keeping an eye on for a while. For the museum professionals out there it has been tough, with more thefts taking place since I published on the situation from a museum perspective at the end of 2011. On a more heartening note, there have been more arrests as well. Of course, things have been far tougher on the rhino populations. Poaching rates in South Africa show a steep increase since 2009, when the new wave in poaching was started after a rumour that a Vietnamese official was cured of liver cancer using powdered horn. 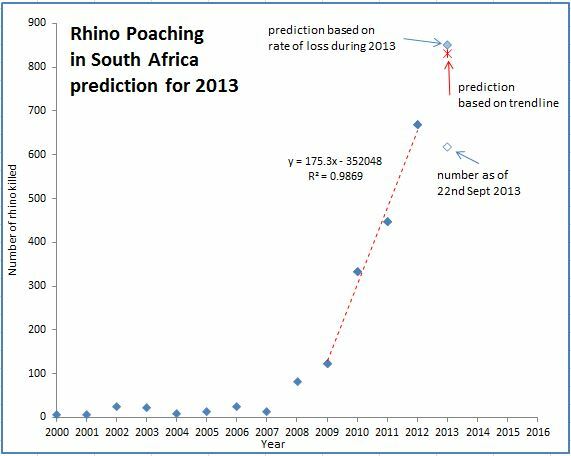 It will be interesting to see whether the increase in poaching rate will follow the trend of the last few years, following the recent arrest of a man reputed to be one of the kingpins of the poaching and smuggling operation from South Africa. Since the boom in poaching, rhino populations have been in decline around the world. In some cases that decline has been very rapid. In 2011 the Western Black Rhinoceros (Diceros bicornis longipes Zukowsky, 1949) was declared extinct and the Javan Rhinoceros (Rhinoceros sondaicus Desmarest, 1822) now only has one surviving subspecies, made up of maybe 40 individuals. All of this because of a single story about cancer. As with most anecdotal claims for cancer cures (from use of vitamins to homoeopathy) there is no good evidence that rhino horn has any effect. Spontaneous remission happens and, assuming the story about the Vietnamese official contained any shred of truth there were probably numerous other treatments being used at the same time, making it impossible to identify which treatment had any effect. If rhino horn was effective, then you might expect the countries that use it, like China, to have a lower cancer mortality rate than other parts of the world – but this is not the case. Even practitioners of Traditional Asian Medicine have explicitly stated that there is no evidence that rhino horn can cure cancer. Moreover, if rhino horn did have any effect on a cancer, that effect should also be found by using powdered cattle hooves – a cheaper and more sustainable product. Rhino horn use is not sustainable at all. 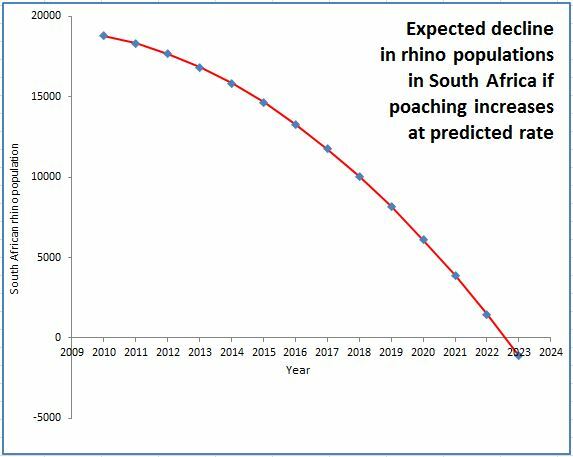 If the poaching rates continue to increase as they have been, my very quick and dirty calculations suggest that rhinos could be extinct in South Africa in as little as 10 years. This is why it’s so important to raise awareness of the problems facing rhinos and communicate the fact that rhino horn is not a cure for cancer. Time is potentially very short for the populations that remain. I was hoping that it might be a little bit of a challenge because it doesn’t seem to have any really diagnostic characters, but your shape-matching skills were good and several of you managed to get a close identification. Heather was straight in with the suggestion of it being the back part of the frontal bone (the bit that makes up the front and top of the skull) of an Aurochs – the very large, extinct ancestor of modern Cows. Wouter van Gestel also suggested one of the large bovids – the Asian Water Buffalo, and Ben Gruwier agreed with both Heather and Wouter in saying that it was from a large bovid. This was as far as I had managed to get with the identification myself, however the specimen had a number (39.16), which I was able to check against the natural history registers. The first part of the number told me to check in the register for the year 1939 and it was the 16th entry for that year, so it was easy to find (unlike with some numbering systems with museum specimens). It turns out that this specimen is in fact the frontal bone of a Gaur or Indian Bison Bos gaurus Smith,1827, and it turns out that the Gaur has a distinctive ridge between the horns, which is what this specimen is showing, so I should have been able to work it out from the morphology (I will be able to in future). Bull Gaur can weigh up to 1.5 tonnes and stand 2.2m (7’2″) to the shoulder – they’re enormous. Their only natural predators are the Tigers and large Crocodiles they share their Southeast Asian forest habitat with, but even then Gaur have been known to kill Tigers by trampling and goring them. Perhaps unsurprisingly these animals are far more risk from humans and have been hunted for meat and trophies until they have become threatened. They are protected by CITES (the Convention on International Trade in Endangered Species), but illegal trade continues and their forest habitats are constantly being lost due to human encroachment. It’s disheartening that so many of my mystery objects end with a comment about human activities driving a species towards extinction, but unfortunately it’s a massive problem in the world we live in. I wonder if there will be any wild Gaur left in 2039, just 100 years after this specimen was collected?